(Bloomberg) -- After years of gloom, the oil industry’s out of its slump. Three-quarters of senior oil and gas professionals surveyed by energy and maritime services company DNV GL AS say they are optimistic about the sector’s growth in 2019, their sunniest outlook since before the crude-price collapse in 2014. 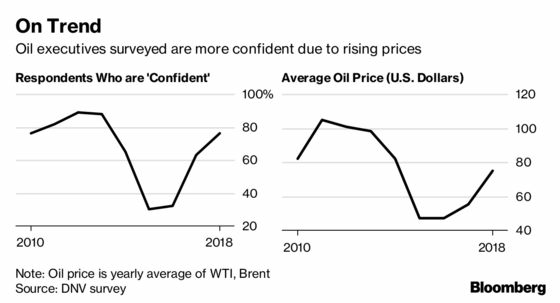 Confidence across the energy industry is now where it was in 2010, when Brent soared to $95 a barrel, about 50 percent above today’s level. That good cheer will translate into higher spending, with 70 percent of professionals saying they’ll maintain or increase capital expenditure budgets this year. Many companies now say they’re competitive even as oil-price volatility heightens in reaction to geopolitical turmoil, after cutting costs to survive a collapse that lasted until 2017. Still, lurking in the data were some risks to the business. The last time the industry was this confident, spending soared. That was fine as oil rose but during 2014 the crude decline hit companies, crimping returns at many of their projects. Throughout the downturn executives focused on cutting spending. In 2016, 41 percent of those surveyed said “cost efficiency” was their highest priority. Now with prices back above $60 a barrel, just 21 percent say it’s the highest priority. The relaxation around the budget may partly reflect the fact that a lot of cost reduction programs have already been implemented. However, not everything will stay cheap. 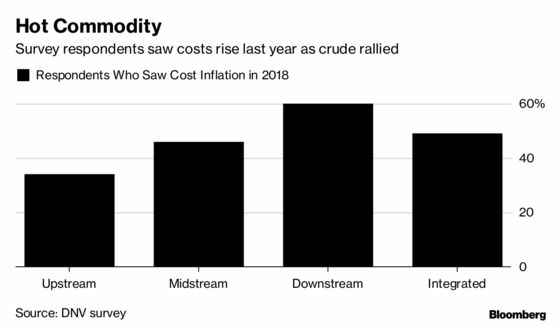 About half of companies said they saw price inflation in 2018, with the downstream portion of the industry hit worst. In the upstream segment, only a third of companies said prices increased. Another challenge for the oil and gas business is its aging workforce which could leave roles which won’t be filled easily. Young people largely find the industry unappealing because they either think it’s old and polluting, or are drawn to other jobs at tech companies, the report said. Respondents highlighted skills shortages as the industry’s biggest barrier to growth in 2019, outside of general competition and the oil price, a finding which Hovem said surprised her. Digitization is the top research and development priority for the oil business in 2019, as companies see additional cost savings and safety benefits in automating processes. Meanwhile investment in low-carbon energy will be small, with most respondents saying regulations are the main motivation to spend in the sector. The DNV study incorporated the views of 791 senior oil and gas industry professionals between October and November, just as the price of crude slipped into its biggest quarterly decline in four years. It includes companies all over the world across a variety of oil and gas roles, from service companies, to explorers to refineries.